The Connect web portal that you see and feel is able to be customised to suit your brand. This includes the colour theme and adding your own logo. When any users from your Enterprise login to Connect, this includes your end-users if they have been invited to Connect as well as any centre staff, will be presented with the Connect in the style you have chosen. 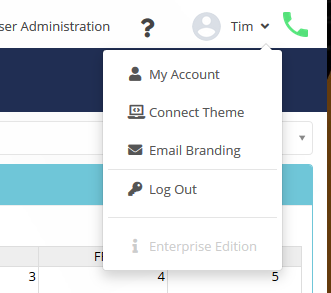 Before we get started, it is important to note that the configuration of the Connect Theme is available to Connect Super Admins only and changes saved here will apply instantly to the Connect web portal for all users across your Enterprise. As a Super Admin, in the top right corner of Connect under the Profile menu, click into the Connect Theme menu. Once inside this menu, you are able to upload a logo of your choosing which will display in the top left corner replacing the default Connect logo. Maximum image dimensions must not exceed 200 x 48 pixels and must be less than 2MB in file size. You are able to set the desired colour theme of Connect including the headers, button and text colours. Use the colour picker to choose the colour you would like for each area or you can enter in the exact hex code. A background image is available to be uploaded and will display as a watermark in the background of all pages on Connect. Once you are ready to apply the desired theme, click Save. This will apply the new settings instantly to the Connect your centre staff and your end-users see and use.